Most homeowners already know the benefits of a fresh coat of paint. Inside, new paint can change a dull room into something you'll want to show off; painting the outside of your home a new color can not only increase your curb appeal, but, when done well, can also protect the material underneath the paint from the elements. To truly get the most out of a new paint job, whether it's inside or out, you not only need the right paint for the task, but it needs to be applied properly. Hiring a professional San Diego home painter is a step in the right direction to getting the kind of results you want in the amount of time you need them. Painting the outside of a house is an incredibly big job, which is why, for many southern California residents, hiring a pro is pretty much a no-brainer. Along with having the best equipment for the task, a San Diego house painter is likely to have a vast amount of knowledge about what paints (or even colors of paint) tend to hold up best in the environment. Additionally, exterior painting often involves a fair amount of sanding, stripping, and other prepping before the top coat can be applied. When you add in the hassle of getting to hard-to-reach spots, the fact that most do-it-yourselfers leave this project to the pros is easy to understand. Painting the inside of a house is a job that many homeowners like to tackle themselves. On the surface, it's pretty straightforward: pick a color, and then paint the wall. If you want the kind of results that are possible with professional help, however, the process is a bit more involved. When dealing with interiors, it's possible that you won't need to strip or sand away any existing paint, as it won't have been exposed to the same kind of abuse as outside paint. On the other hand, existing cracks or chips don't go away on their own, and unless you're using textured paint (and applying it the right way), you might end up seeing these types of blemishes show up again sooner than you think. 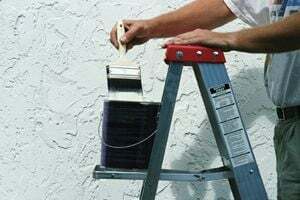 A professional San Diego home painter will know the tricks of the trade that will keep your interiors looking as good as possible for as long as possible. Though less of an issue indoors, having the right paint for the job is still a huge factor in how the finished product will look, especially a year or two down the road. The fact is, most homeowners have neither the knowledge of what's available, or access to the equipment needed to do the job best. San Diego home painters will not only explain your options to you and give you advice on what will work in your situation, but they'll also show up at your home with the best equipment and a crew trained to do this project quickly, efficiently, and beautifully. When you consider how much effort and time it takes to get optimum results on your own, it's no wonder why so many homeowners opt for hiring a professional home painter. San Diego residents looking to paint the interior of their house can expect a bill of around $3,000 on average, with specific jobs ranging anywhere from $1,000 to $6,000. For exterior painting, the range is about the same, but the average is slightly higher. Comment: We have a fiberglass front door that needs to be repainted. Comment: Underneath the overhand of the roof of my house, (eves) 6434 Del Cerro blvd, san diego, 92120, the paint is in fairly bad repair. I think it will need scraping, sanding, power washing or some combination of these procedures to make the surface ready to be painted. Comment: Want to paint 6 accent walls. Two bedrooms, hallway, kitchen and two baths. One wall in each. Two colors. Comment: my uncle has lived in this apartment for over 30 years and the apartment complex will not repaint. it needs a new fresh look. San Diego Painting Contractors are rated 4.77 out of 5 based on 1,128 reviews of 61 pros. Not Looking for Painting Contractors in San Diego, CA?